Points of contact injuries are possibly the most common complaints among cyclists. We're talking here about the parts of a cyclist that touches their bike: the hands, the feet, and the bum. As for the bum, saddle sore is the main thing to watch out for. It's caused by friction between your skin, clothing and the saddle, and can result in sore buttocks and/or a pretty nasty rash. By holding the handlebar in the same position for a long period of time, gripping it too tightly, or leaning too far over the front wheel, you run the risk of compressing the ulnar nerve, which runs all the way from the little finger up through the elbow and into the upper arm. It's the largest unprotected nerve in the body, so it's easy to damage. There are manly technical ways to resolve problems with the ulnar nerve, but honestly the simplest preventive measure is to make sure that you move your hands around the handlebar a bit. Try not to get stuck in one position on long rides. Road bikes are specifically designed to allow riders to grip the handlebars in different places - on the sides, above, or down below on the drops - so just make sure to alter your position as you ride. If you start to feel pins and needles or discomfort in your hands and fingers while riding, that's your body telling you that you're not shifting position frequently enough. The tightness doesn't always manifest itself when you're on the bike because the body adapts to the rhythm of the pedal stroke, but try a non-cycling movement pattern like running and you soon notice that your legs aren't right. The problem also gets exacerbated by cycling longer distances than you're used to, when tightness in a calf or hamstring can lead to muscular tearing. The simple answer is to make sure that you warm up before exercise and cool down afterwards. Stretch your calves out so the muscle fibres retain their elasticity. A foam roller used at the end of a ride can also do a huge dollop of help: it's painful, but using them to smooth out your muscles will reduce any lasting tightness. If you look at professional cyclists, one of the first things you notice is the size of their quads. But we can see all cyclists rely on the muscle that runs along the top of their legs to power their bike forwards. As a result, this tends to be where cyclists suffer fatigue. A DIY trick to keeping your quads in shape is to use kinesiology tape (applied before starting), which can promote muscle endurance and aid recovery. 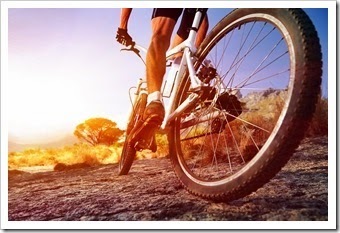 Another good idea is to alternate between pedalling in and out of the saddle. This will spread the load among other muscles and avoid overloading the quads. Back posture on the bicycle can strain the lower back, a result of the lumbar spine flexing or pulling up). Position on the bicycles, with the neck arching back, can strain the neck and upper back, especially when the bicycle is equipped with aerodynamic bars. Rough terrain increases jarring and compression to the spine, which can lead to back pain. The best answer is to get a professional bike fit done. It will set you back £100 or so, but you'd be amazed how much difference small tweaks (for example, to your saddle height and handlebar stem) can make. So if you’re unsure of what size bike frame you need, ask before you buy. Most bike shop employ­ees will be happy to help you find a good fit and let you take a test ride to be sure. Once you've found that perfect riding position, those aches and pains in your back disappear pretty quickly. Another option is to use kinesiology tape on the lower back area. It will help stimulate the skin in the area, promoting muscle function and decreasing pain. Tak­ing the time to stretch can help pre­vent a lot of overuse injuries and cramp­ing. Pay extra atten­tion to your ham­strings and quadri­ceps, which tend to cramp and tighten most often for cyclists. If you do cramp up, take a break and give your­self a mas­sage with your knuck­les to loosen the mus­cles. Foam rollers are also great for self-massage, though be pre­pared for the pain that comes with rolling, because it’ll hurt. It’ll hurt so good. It’s unbe­liev­able how many peo­ple still ride with­out pro­tect­ing their nog­gins. For­get hel­met hair, a head injury could keep you off your bike forever. Crashes may not be that common among sensible amateur cyclists, but if you want to avoid injury there's one bit of advice that should never be ignored: always wear a helmet!